Most people in manual wheelchairs are able to navigate minimal changes in elevation such as street curbs and door thresholds. However, those confined to electric or powered wheelchairs cannot handle the level change and are forced to stay on the lower level where the location may not be as desirable. Capitalizing on the design of our ergonomic lifts used for industrial and vehicle applications, Herkules has developed a line of adaptive lifting systems to serve the needs of those in wheelchairs. The Herkules Handicap Lifting Systems (HLS) are specifically designed to address all accessible obstacles that have changes in floor level from 0 to 60”. The adaptive lifts can be used in most commercial and residential applications, but can be used for plane, train and boat boarding access as well. 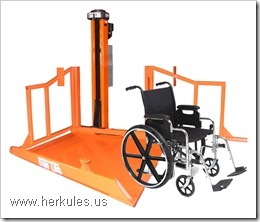 All Herkules Handicap Lifting Systems are designed to conform to ADA (American Disability Act) regulations, and are designed with operator safety in mind. All systems utilize safety guarding and skirting, and have built-in fail-safe and anti-fall devices. Pneumatic Handicap Lift: This system utilizes the unique air-bag and scissor arm design for which Herkules is known. The low-profile lift collapses down to 4” and has lifting capacity of 1000 lbs. A custom designed ramp (designed to ADA rise/run specifications) would enable the individual to roll his or her wheelchair onto the lift, raise it to the desired height via the use of a push button or toggle switch, and roll the chair onto the higher floor level. The pneumatic lift is used for lifting heights up to 29”. The lift system design can accommodate a hydraulic lift mechanism as well. ACME Screw Handicap Post Lift: This system utilizes a pedestal which is bolted to the floor with a moving platform that provides three-sided accessibility. The lifting motion is provided by a high-strength ACME screw drive system that is powered by a 220V – 240V 3 phase, 30A motor. The wheelchair platform has a 48” maximum lift capacity of over 1000 lbs. Electric Hydraulic Handicap Post Lift: Similar in design to the ACME Screw Handicap Post lift, this system uses an electric motor with hydraulic cylinder to raise and lower the wheelchair platform. The lift can handle lifting heights of 70” with weight capacity of over 1000 lbs. Belt Drive Handicap Lift: This adaptive lift utilizes a redundant belt system with limit switch control which prevents the lift from falling should the primary belt drive fail. Since the Belt Drive Lift has no fluid or gas that can leak, it is perfect for food preparation, restaurant or clean-room environments. The belt is safely enclosed in a compact steel module which is located on one side of the wheelchair platform. You know Herkules Equipment for our unique industrial lifting solutions; let Herkules assist you with your adaptive lifting device needs as well. This entry was posted in Lift Table Information and tagged Herkules Handicap Lifting Systems by adminenkon. Bookmark the permalink.